Intra-articular – most commonly arising from the anterior cruciate ligament (ACL). Extra-articular – encountered in any of the soft tissues around the knee, including the joint capsule, tendons, ligaments, bursae, muscles, and nerves. Intraosseous – generally in the epiphyseal–metaphyseal region, commonly proximal tibia. Periosteal – extremely rare, most commonly in proximity to the pes anserinus. A meniscal cyst is a focal collection of fluid either within (intrameniscal) or adjacent (parameniscal) to the meniscus, both associated with a meniscal tear. 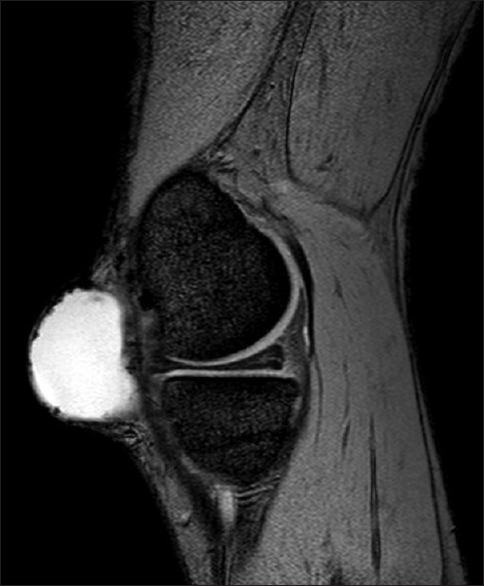 We would like to present a rare presentation of a recurrent cyst at knee joint level, initially thought to be meniscal but confirmed on magnetic resonance imaging (MRI) to be a medial collateral ligament (MCL) ganglion cyst. 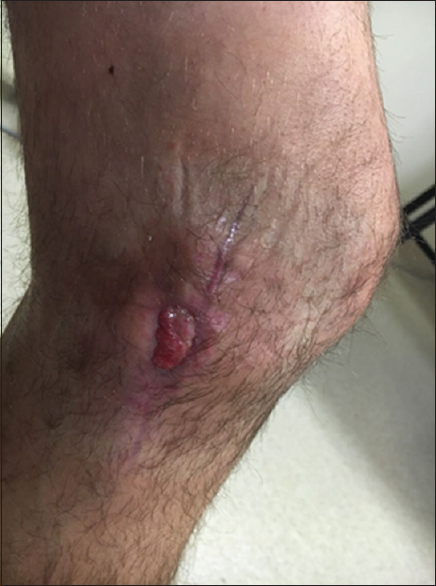 A 34-year-old Caucasian male was admitted to the Orthopaedic Department through the Emergency Services with complaints of gradually worsening swelling on the inner aspect of his left knee with skin redness over a period of 2 weeks. He denied pain or restriction of knee movement. He had previously undergone three excisions (two arthroscopic and one open his last one being 12 months ago) of a medial meniscal cyst. This diagnosis was apparently confirmed on an initial MRI scan, but further two surgeries were on clinical grounds. He was otherwise fit and well, with no known comorbidities. On examination, he was systemically well and had a full range of motion in his left knee. 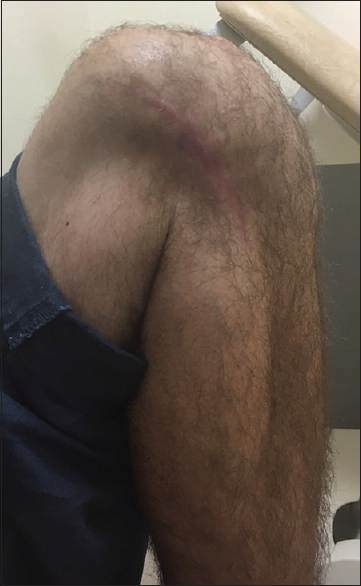 The well-circumscribed swelling measured 3.8 cm x 2.5 cm at the level of the medial joint line with associated skin erythema, clinically resembling an abscess [Figure 1] and [Figure 2]. It was fluctuant, non-tender, immobile and did not change in size on movements of the knee. There was no regional lymphadenopathy. His blood investigations were all normal, with C-reactive protein (CRP) of 0.7. 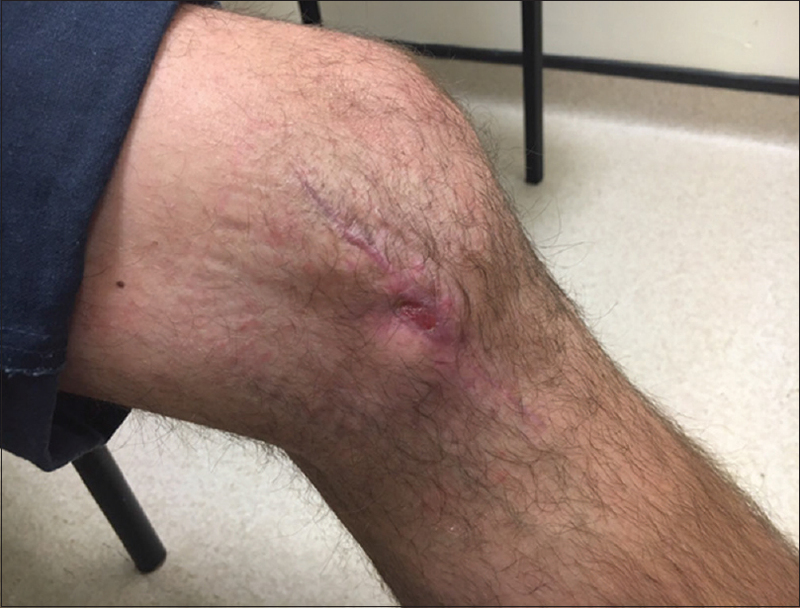 Our initial diagnosis was that of an infected recurrent meniscal cyst and theoretically a septic knee joint, but physiologically, he was systemically well in himself. This, therefore, leads us to further investigate his knee with an MRI scan which revealed a well-circumscribed homogeneous signal hyperintense lesion (T2 weighted) lying intimately associated to and superficial to the MCL [Figure 3], [Figure 4], [Figure 5]. The underlying MCL was thickened but intact. No medial meniscal abnormality or tear was demonstrated. 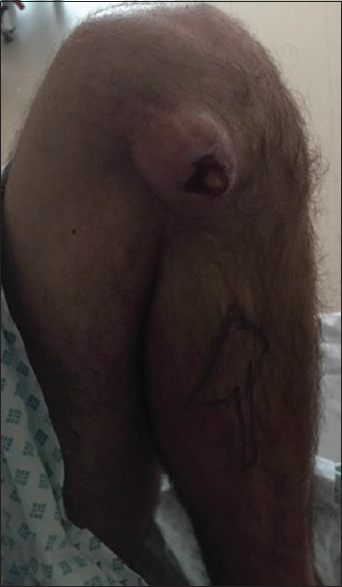 He had an open excision of the MCL ganglion cyst, including the overlying skin. Tissue biopsy confirmed our diagnosis of MCL ganglion cyst [Figure 6]. His surgical wound, unfortunately, dehisced [Figure 7] and [Figure 8] postoperatively and therefore had to be splinted in knee extension for 2 weeks. The wound eventually healed [Figure 9] and [Figure 10] with secondary intention in 4 weeks, and he regained full function of his knee, extremely pleased with the outcome. 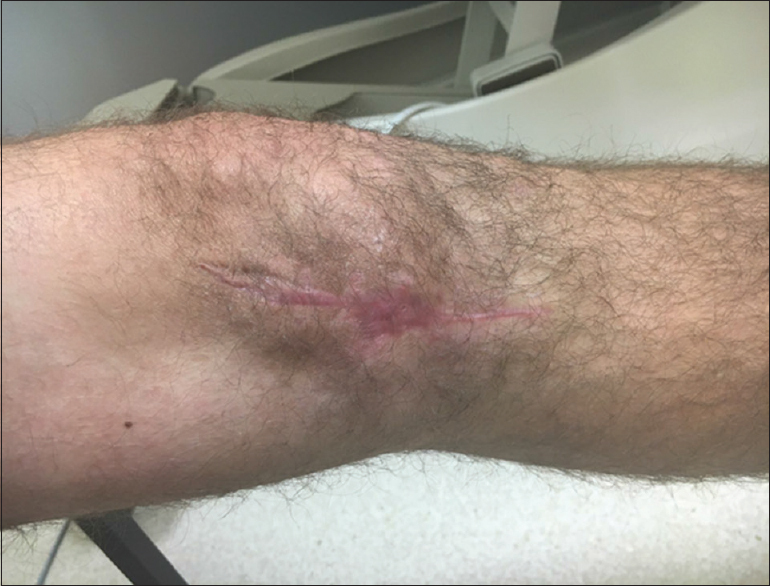 Six-month postoperatively, there were no signs of recurrence, and he had an Oxford knee score of 45/48 (pain 17, instability 4, and function 24). There are various case series of intra-articular ganglion cysts, most commonly ACL cysts; however, extra-articular soft-tissue cases have been described in very few reports. Ganglion cysts may be located in any of the extra-articular soft tissues around the knee, including the joint capsule, tendons, ligaments, bursae, muscles, and nerves. Rarely, they communicate with the joint space as opposed to synovial cysts, which may be a cause for their recurrence. These lesions are frequently asymptomatic, but larger ganglia may present with pain. MRI findings of extra-articular ganglia include well-defined rounded or lobulated fluid collection, often associated with peripheral fluid-filled pseudopodia and sharply defined internal septations. They may be associated with secondary changes in surrounding tissues, including pericystic edema and bone remodeling. Extensive dissection along tissue planes may also occur. 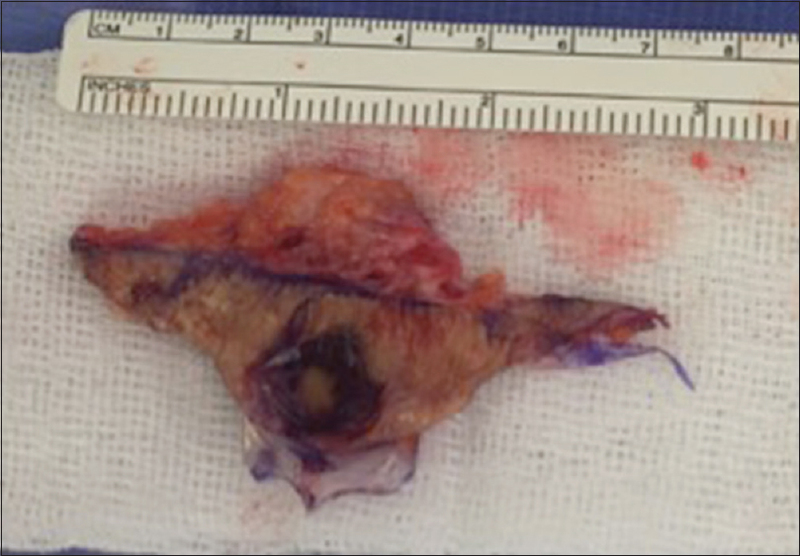 It is important to determine whether a communication with the joint capsule is present as failure to remove the capsular components of these lesions (in case of excision) may lead to recurrence. Our case had three previous excisions of a supposedly diagnosed medial meniscal cyst. On examination, the size of the swelling did not change with movements of the knee. He had a full range of motion and no pain, with a CRP of 0.7, which led us to further investigate with an MRI. This confirmed that the swelling was indeed extra-articular and affecting the MCL with normal appearances of the medial meniscus and no tear. The lesion was totally excised with skin and went on to heal with no signs of recurrence after 6 months of follow-up. 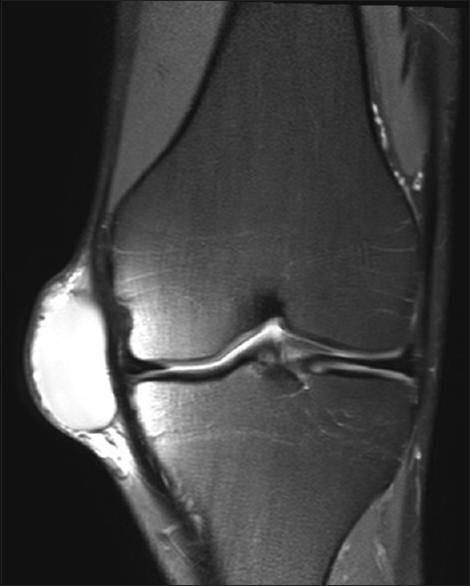 We have learnt that all recurrent cystic swellings at knee joint level should be approached with caution and we recommend MRI as the gold standard for further evaluation to aid in appropriate surgical management. 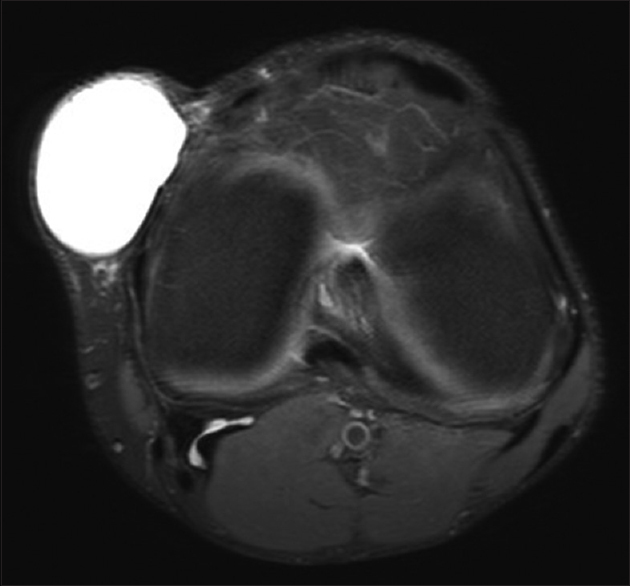 Perdikakis E, Skiadas V. MRI characteristics of cysts and “cyst-like” lesions in and around the knee: What the radiologist needs to know. Insights Imaging 2013;4:257-72. Park SE, Panchal K, Jeong JJ, Kim YY, Ji JH, Park SR, et al. Extra-articular ganglion cysts around the knee joint. Knee Surg Relat Res 2015;27:255-62. Telischak NA, Wu JS, Eisenberg RL. Cysts and cystic-appearing lesions of the knee: A pictorial essay. Indian J Radiol Imaging 2014;24:182-91.